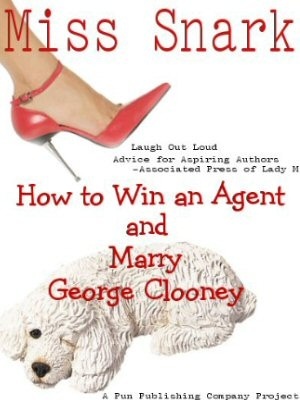 Miss Snark, the literary agent: rights, licenses, POD and "perpetuity"
I looked in your archive and didn't see a reference to this subject specifically. I'm working on a short story to submit to a POD anthology. In the submission guidelines is the following statement: "All submissions remain the property of the contributor. Due to the never-out-of-print nature of POD publication, the editors of Dead Will Dance reserve the right to reprint the collection in perpetuity." Does the fact that I retain my rights to the work mean I can submit this story (if they accept it) to other publishers? Are there any "gotcha's" with this model? Uhh...these guys are confusing apples oranges and orangutans. First, ALL material is ALWAYS the property of the writer. When a publisher or the National Enquirer or the New Yorker or the Bamboozle Floozy Gazette undertakes to publish your work they buy a LICENSE to do so. A license has two things: territory and duration. (it has other things too but those are the biggies). If these clowns want your work in perpetuity the answer is no. And no, generally you can't sell something again that is licensed to another publisher. That's the territories part of the license agreement. Chances are it will never matter. I was VERY careful to get reversion clauses in one of my authors contracts. The license buyer, a very savvy businesswoman, did not look on this as trying to hoodwink her. She understood exactly what we needed and agreed to the change in language without turning a hair. Good thing too. A major publisher is now licensed to publish the work that includes what was previously elsewhere. You have no idea what the future holds. Giving up your work with no chance to get it back (and for no money right?) is foolish. Don't do it. Yes, it sounds like they'll be able to keep holding on to your rights forever. If you have any hopes for the future whatsoever, don't do this. It might not be enforcable, since contracts with terms that never expire often aren't, but it's still not worth the risk. Besides, you'd have to get a lawyer, wasting money and time, to be let out. "In perpetuity" means exactly that. I hate to curse but Y#$#@**#@ ! That phrase means that after you friggen DIE, they retain rights to print and make money from your story. Since forever is longer than the universe has been around (14 or so billion years). I think this is a bad idea. Get a lawyer who understands publishing contracts BEFORE you sign. My single investment mistake of $2000 (when I didn't talk to a lawyer) cost me $30,000.00 and ten years of legal and financial grief. So don't sign a contract like that and get an agent or lawyer to advise you. They say the rights remain with the author. In other words, selling to them doesn't mean you can't sell to someone else. They just need the rights they ask to keep the book in print. How could they publish a POD if they don't retain the right to do so? Should they reword it? Call it reprint rights. Set a reversion limit based on sales? Thanks Miss Snark for the answer. My spider sense starting tingling when I read that as well, but am not experienced enough with publishing to know exactly why that was wrong. I haven't signed (or even submitted) anything yet, so no worries there. Thanks again! I've seen other places say that too. Of course then in they continue on to say some thing like "on a non-exclusive basis" which would mean they can keep printing it for as long as they want, but after the exclusive is up you can sell is as a reprint. I checked these guidelines and they DO NOT say this. So yes, because it's not there you're giving your story away forever. And for $20 or a copy of the POD. Someone in the comments here pointed out that the story remains the property of the author, which is true. but just that they don't specify an exclusive/non exclusive time period means not only you can translate it the way you did, they can too. I once signed a contract that gave my story away until the book was out of print. But I get royalties off it as long as it is in print, so I'm okay with that. always watch what rights the market is grabbing ad for how long.